General Information: In areas ranging from the Middle East to eastern and southern Africa, numerous species of wild figs have grown for thousands of years. Fig seeds have been found in Bronze Age settlements in the Mediterranean and remains of dried figs were discovered in the ruins of Pompeii. Figs were actively cultivated as a staple in the diet of the Spartans, and Romans fed figs to geese they kept to warn them of invaders. When the Romans introduced this custom to the Gauls, it is speculated that foie gras, the delicacy obtained from force fed geese was born. The cultivated fig, Ficus carica, derives its name from the ancient region of Ciara in western Turkey, and is a member of the mulberry family. Turkish dried figs are the original Smyrna cultivar, a species which requires pollination for the fruit to set. Tiny wasps are needed to achieve this pollination. Although many varieties of figs are grown throughout Turkey, the large, sweet, light colored variety known as 'Sarilop' which are grown for drying purposes are intensively cultivated in the Izmir and Aydin provinces near the Aegean Sea. Today, Turkey is the world's leading producer of dried figs. Dried figs have one of the highest contents of polyphenols substances thought to offer the benefit of reduced cancer risk. Fig consumption has also been increasing due to the fruit's recognized high mineral and ferrous material content. Figs are an important source of essential amino acids and vitamins, and dried figs offer significant amounts of calcium. 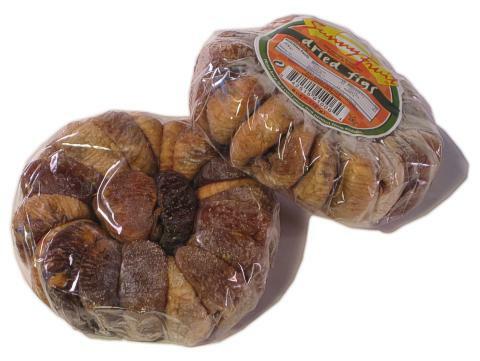 Applications: Moist and succulent, Turkish Figs are simply great! These figs are all natural with no preservatives and one of the sweetest fruits available. Always moist and always fresh, these are tops when it comes to snacking and baking.